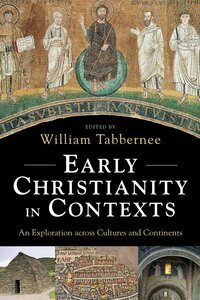 About "Early Christianity in Contexts: An Exploration Across Cultures and Continents"
William Tabbernee (Ph.D., University of Melbourne; D.D. (Honorary degree), Phillips University, Litt.D., University of Melbourne). is President and Stephen J. England Distinguished Professor of the History of Christianity at Phillips Theological Seminary, Tulsa, Oklahoma, USA. A world-renowned specialist on Montanism, Dr. Tabbernee, in 2000, led an international team of archaeologists and historians which discovered the long lost site of PepouzaMontanisms most holy city. He is the author of Montanist Inscriptions: Epigraphic Sources Illustrating the History of Montanism (1997); Fake Prophecy and Polluted Sacraments: Ecclesiastical and Imperial Reactions to Montanism (2007); and (with Peter Lampe) Pepouza and Tymion: The Discovery and Archaeological Exploration of a Lost Ancient City and an Imperial Estate (2007). Most recntly he has written Prophets and Gravestones: An Imaginative History of Montanists and Other Early Christian..